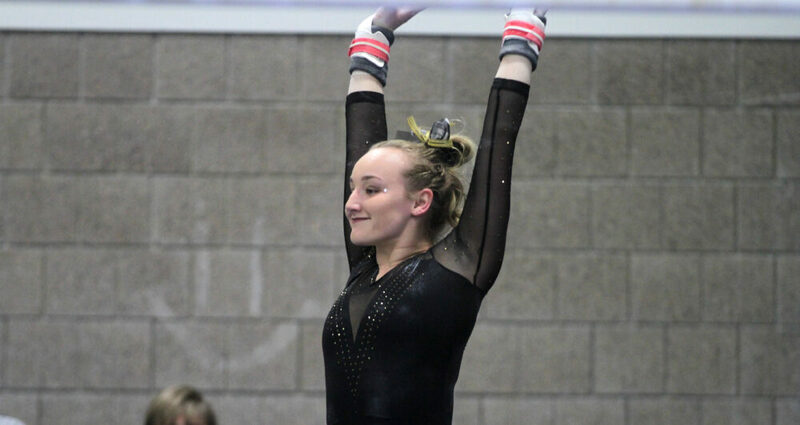 EAU CLAIRE, Wis. – The Gustavus gymnastics team posted a season-high 183.825 team score in a WIAC dual meet Saturday at UW-Eau Claire, who scored 185.100. Gustavus totaled 47.500 on floor, 46.850 on vault, 44.825 on beam, and 44.650 on bars. Amanda Malo (Sr., Greenwood, Minn.) won the floor with a 9.650 and the all-around at 37.650. She also took third on both the vault (9.475) and bars (9.300). Sam Ardy (Sr., Thousand Oaks., Calif.) won the bars at 9.500 and placed third on the floor with a 9.550. Gustavus is now complete with its regular season away schedule and hosts UW-Stout at 6 p.m. next Saturday.